ASPCA President and CEO Matt Bershadker with Senator Chuck Schumer (D-NY) and Kirby, a Poodle-mix available for adoption at the ASPCA. On Friday, March 24, we had the honor of hosting U.S. Senator Chuck Schumer (D-NY) at the ASPCA Adoption Center in New York City. The Senator toured the facility, met several adoptable animals, and then sat down with ASPCA President and CEO Matt Bershadker for a Facebook Live discussion focused on the U.S. Department of Agriculture’s (USDA) removal of animal inspection reports and enforcement actions from its website last month. Senator Schumer stands with the ASPCA in our call to the agency to restore public access to these documents. 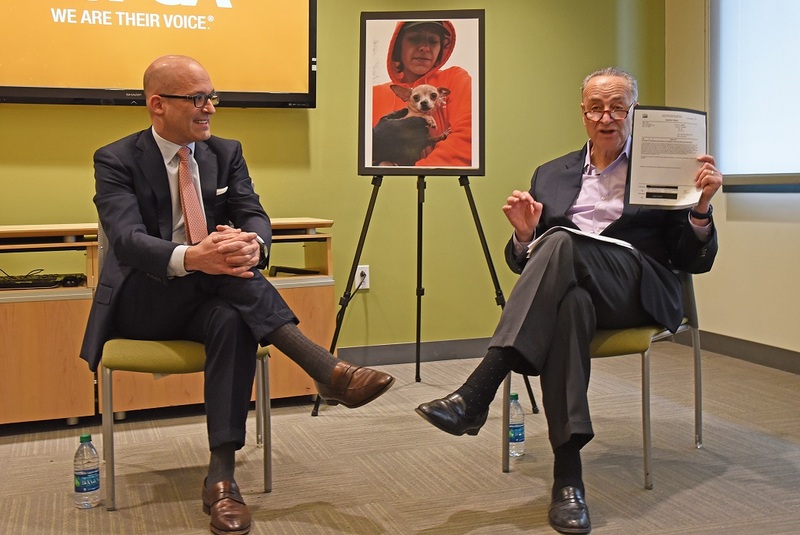 Senator Chuck Schumer joined ASPCA President and CEO Matt Bershadker for a Facebook Live discussion at ASPCA Headquarters in Manhattan. 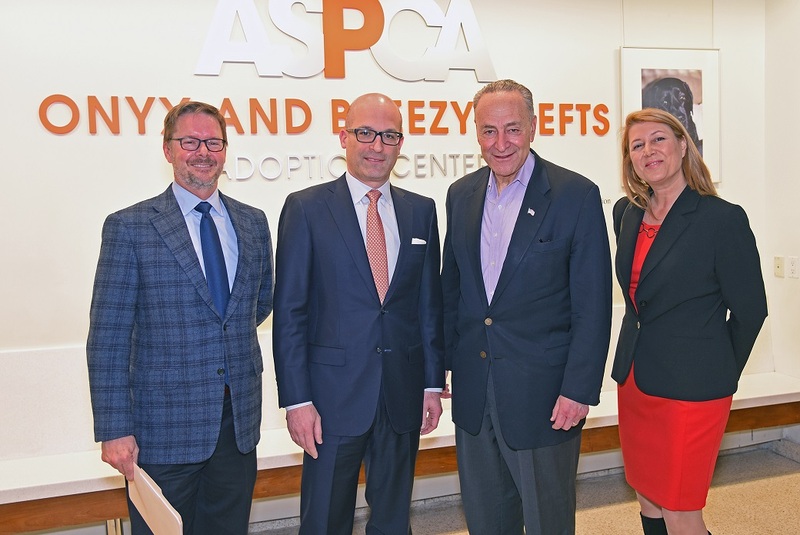 L to R: Richard Patch, VP of Federal Affairs, ASPCA; Matt Bershadker, President and CEO, ASPCA; Senator Chuck Schumer; Nancy Perry, Senior VP, Government Relations, ASPCA. A new national survey commissioned by the ASPCA shows an overwhelming majority (92%) of Americans believe information about the treatment of animals in federally regulated facilities should be made available to the public. The survey also shows that 89% of respondents believe the USDA should restore public access to the information that was removed from its website related to the regulation of facilities licensed under the federal Animal Welfare Act (AWA), including commercial dog breeders, zoos and research labs–information that is critical to the ASPCA’s efforts to monitor puppy mills and advocate for increased protections for animals. In recent weeks, the USDA has reposted select documents to its public website, but has given no indication as to when puppy mill inspection reports will be restored. 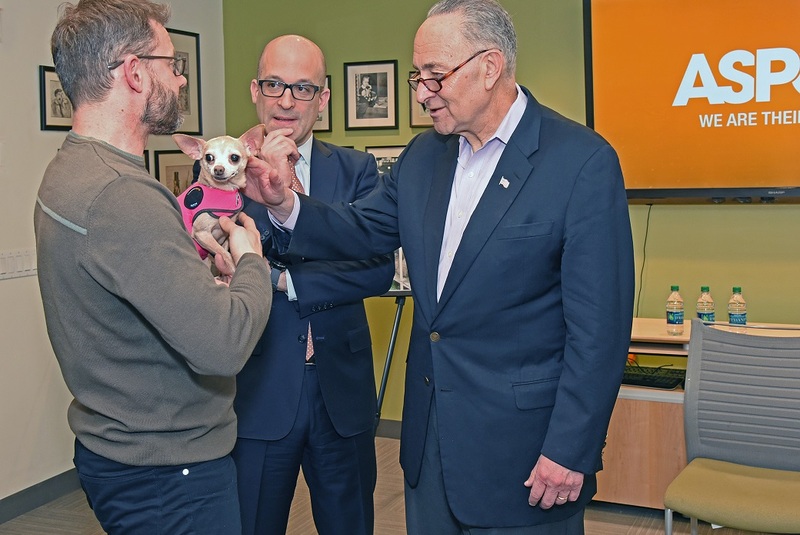 Matt Bershadker, center, and Senator Chuck Schumer with the ASPCA’s Michael Barrett, VP of Grants, and his Chihuahua, Binah, who was rescued by the ASPCA from a puppy mill in Mississippi. Add your voice to the massive public outcry opposing the USDA’s removal of this information from its website. The newly introduced Animal Welfare Accountability and Transparency Act would compel the USDA to restore open, online access to its animal welfare enforcement and inspection information. Visit aspca.org/USDA to email your U.S. senators and representative in Washington, D.C., and urge them to cosponsor the Animal Welfare Accountability and Transparency Act.